Well, it feels like a lifetime ago that we took our trip to AZ and the East Coast, and that's probably because it was!! Linnea still has strong memories from the trip and talks about her relatives often (out of the blue!). We first stopped in AZ for Aaron's "little" brother's graduation from highschool, which was a sweet occasion to be around for! We were so proud of Zach, and it was fun to cheer loudly for him as he received a Christian Character award given to one boy and one girl. I think I almost cried. ;) Seriously, though! What matters more than glorifying the Lord in your daily life?!? 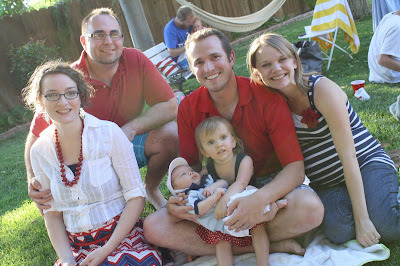 We also had fun swimming, thrift store shopping, and just catching up with family. I will admit though, I was a much less energetic person than normal...I think really starting to feel LARGE and tired! And sadly, I was not on top of the whole camera thing during our time there, so there really are not any pictures! Hopefully Liz did better than I did! Grampy being silly at graduation! We then headed on out to Buffalo, NY, which was a long day of travel, but Linnea did fantastic on the plain! We were SO thankful, because the Lord made it quite clear through some other children that it could have been a MUCH harder experience! From Buffalo we drove down to visit my grandarents, Aunt, Uncle, and cousins. We havn't seen my grandparents since I was pregnant with Linnea, so it was an ABSOLUTE blessing to spend some time with them and allow for them to get to know Linnea! And we hadn't seen my Aunt and Uncle since the wedding, and even then, we didn't really spend much time with them, as it usually goes with weddings! It was so fun to reconnect with them. We arrived on Memorial Day, and they treated us to a yummy BBQ, a super exciting boat ride (I hadn't been on a boat in SO many years! ), and more fun in their back yard. 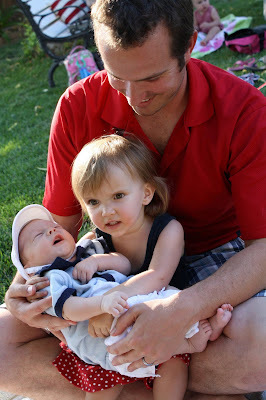 Linnea LOVED her older cousins, Michael and Joey! Linnea enjoyed scticking her feet in! Michael had a track meet while we were there, which was SO fun to see him run! He did a great job! The third day of my stomach flu, we drove over to the east side of NY to end our trip with Aaron's brother's family. We made a pit stop in the town I grew up in, and even got to drive by my old house, which looks exactely the same! :) We were able to spend a little over an hour catching up with my best childhood friend, which was so fun, despite me feeling so ill. And let me tell you...it was a beautiful GREEN drive...another special treat to see God's creation! This ones for the fam ;) It really looks the SAME! My sweet "little" nephew, Andrew! Taking a tour of Westpoint! Linnea enjoying being a "baby" while she still can! The trip home seemed really long...poor Aaron wasn't feeling well, and Linnea was a bit whiny, but again, it really was a smooth trip and we made it safely home! I think once we got home, we were really able to rest up and "recover" from our sicknesses! :) Even though the trip wasn't quite what we expected, we are still very thankful we got to spend time with our precious family, which doesn't happen as often as our families expand! God is SO good! For the 4th of July, we headed up to Northern CA about 4 hours to visit some friends who moved away last summer, and also some more friends who we havn't seen since their wedding in January! I can't tell you what a blessing it was to see our wonderful friends, John and Whitney and their new, adorable little guy, Jackson! It was wonderful to catch up and have encouraging fellowship. It was just precious to get a glimpse of what it will be like for Linnea to have a little sister. She was enamored with baby Jack and constantly asked to hold him. I figured she would get bored of holding him after a while, but we almost always had to tell her it was time to be all done, and she wasn't always quite happy with that. She also wanted to constantly "boop" (poke) him in the nose...really cute, but not such a good idea! :) We also had a great time with the Toland's in Gilroy, but will have to wait for any pics, as I havn't downloaded them yet!